Episode 57 - Bhisma finishes bringing us up-to-date on who Sikhandin is, who he used to be, and why Bhisma won't fight him. This also finishes the Udyoga Parva; the Book of the Effort. Next time, we start in on the Bhisma Parva, the first of the eight Battle Books. Don't assume that the war is about to start, just because we end off on the dawn of the first day of the war. 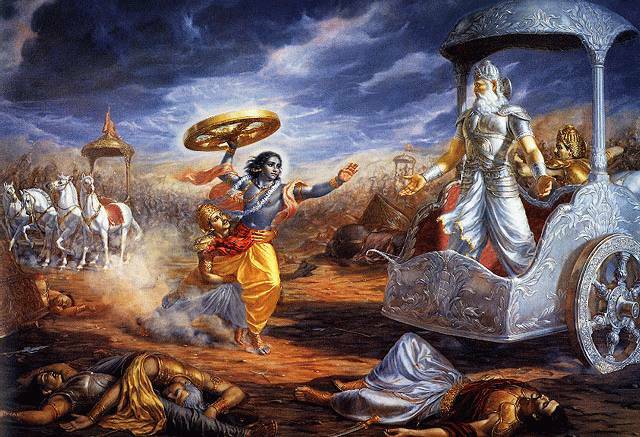 We still have a lengthy introduction in the Bhisma Parva, and then there is the Bhagavad Gita, which will take a few episodes-- we don't want to rush things! You have done a great job. I have listened to all of your podcasts. Where can I find your e-mail address ?